APC’s SMT750RMI2U is part of the award winning Smart-UPS family which is the most popular UPS in the world for servers, storage and networks. The 2U rackmount 500W 750VA UPS is trusted to protect critical data and equipment from power problems, and supplies clean and reliable network-grade power. In addition to legendary reliability and manageability, Smart-UPS units have extremely high efficiency at low, medium and high load levels, making them ideal for today’s multi-core or virtualized servers that have varying load consumption. 4. Push Button Circuit Breaker enables quick recovery from overloads. APC’s SMT750I is part of the award winning Smart-UPS family which is the most popular UPS in the world for servers, storage and networks. The 500W 750VA UPS is trusted to protect critical data and equipment from power problems, and supplies clean and reliable network-grade power. In addition to legendary reliability and manageability, Smart-UPS units have extremely high efficiency at low, medium and high load levels, making them ideal for today’s multi-core or virtualized servers that have varying load consumption. APC’s SMT1000I is part of the award winning Smart-UPS family which is the most popular UPS in the world for servers, storage and networks. The 700W 1000VA UPS is trusted to protect critical data and equipment from power problems, and supplies clean and reliable network-grade power. In addition to legendary reliability and manageability, Smart-UPS units have extremely high efficiency at low, medium and high load levels, making them ideal for today’s multi-core or virtualized servers that have varying load consumption. Trust to protect critical data and equipment from power problems by supplying clean and reliable network-grade power. In addition to legendary reliability and manageability, Smart-UPS have extremely high efficiency at low, medium and high load levels making them ideal for today's multi-core or virtualized servers that have varying load consumption. Smart-UPS series have long been considered the benchmark for all network and server UPS's. Smart-UPS feature a 16-segment LED display, extended range automatic voltage regulation (AVR), and pure sine wave output on battery. APC's slim line rack-mount Smart-UPS delivers premium uninterruptible power and the most advanced performance features available. With PowerChute plus software the uninterruptible power supply (UPS) will safely store data and shut down your network operating system before the battery is fully discharged, whether you're there or not. SmartSlot internal accessory slot allows you to install optional accessories to enhance the performance of your UPS. Additionally, the APC NetShelter enclosure provides security, flexibility and proper management of all your rack-mount devices. APC’s SMT1000RMI2U is part of the award winning Smart-UPS family which is the most popular UPS in the world for servers, storage and networks. The 2U rackmount 700W 1000VA UPS is trusted to protect critical data and equipment from power problems, and supplies clean and reliable network-grade power. In addition to legendary reliability and manageability, Smart-UPS units have extremely high efficiency at low, medium and high load levels, making them ideal for today’s multi-core or virtualized servers that have varying load consumption. APC Smart-UPS protects your data by supplying reliable, network-grade power in either traditional Tower or Rack-optimized form factors for space constrained business critical applications. Award winning APC Smart-UPS is the perfect UPS for protecting business critical fileservers (Intel or UNIX based), minicomputers, network switches and hubs, Point of Sale, retail/bank back office and ATM's. 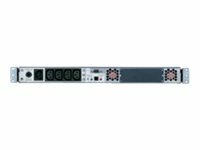 Rack Mount versions are the choice for rack optimized servers, server appliances, blade servers, other blade devices and rack-mounted network switches and hubs. With included PowerChute management software for servers and workstations, IT administrators can provide safe system shutdown and advanced UPS management (all major operating systems are supported). Connectivity is through serial or USB port (USB not standard on all models). Additional manageability is available through the SmartSlot, an internal accessory slot that allows you to install optional accessories to enhance the performance of your UPS. Network connection with Web browser management and/or environmental monitoring, serial port expansion, and out-of-band management options are available. With pure sine-wave output ensuring compatibility with all connected devices, Intelligent Battery Management ensuring a highly available UPS and an advanced 16 segment bar graph display ensuring information and management, the Smart-UPS is a UPS you can count on.